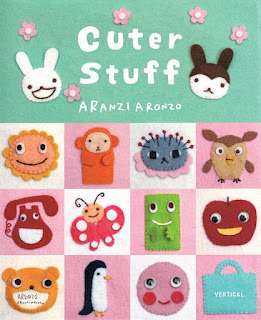 I'm wild for Aranzi Aronzo's books- especially the craft books. I love Japanese felt mascots and crafts and they are always well done. Vertical Inc. publishes English translations of Japanese books and they are well translated so they make sense. Their cookbooks and craft books are among my favorites for that reason. This book is a translation of Feruto No Komono. When you open the book, you'll find pages of instructions. Sweetly illustrated, it explains the supplies you'll need, stitch techniques and abbreviations, tips for keeping things in place while you're working and how to trace or copy the patterns. The instructions are clear enough that a complete novice at hand sewing can follow them. The projects are great. My favorite thing about felt sewing is that it's a great way to learn basic hand sewing skills very inexpensively and making some great things. For people who are more experienced, it's instant gratification. These trendy, cute projects are something that nearly anyone would enjoy making. Projects include pencil cases, pen covers, key cases, jar or can covers, little soft trays with appliques, magnets, coasters, flowers,coin cases and card cases. All made with totally cute characters, and easily personalized. They show how easy it is to change an expression by how you make the mouth and how you can use simple shapes to personalize everything. My own felt crafting tip- use sharp sharp scissors. I have a pair set aside specifically for felt. You could make a felt mascot to mark the handles of your felt scissors! Stitches used are running stitch, straight stitches, whip stitch (which they call overlock), French knots, back stitch, Supplies are inexpensive. You can use eco-craft felt, or if you want to splurge, use wool felt. It's hard picking a favorite project out of the book, but if I have to- it's the face magnets. It's a very simple project that makes a great gift. There are also tips for using the patterns and techniques in different projects- like doing an applique on a shirt or using two coasters sewn and stuffed for an ornament. Fun book, and one I happily recommend for anyone 9 years old and up. This book will be released on November 24, 2015 and it's available for pre-order on Amazon now.